On Tuesday, I told you the 2 greatest challenges your healthcare network will face in 2018. Now here’s the 2 strategies you need to remember if you want your healthcare network to stand out from your competition. If you want to stand out, you need to do things differently. You have to disrupt the status quo in healthcare marketing. The status quo is using traditional methods for advertising: billboards, TV and radio commercials. Maybe taking a full-page ad in the local newspaper next to the competition’s ¼ page ad. The spiciest the status quo gets is sponsoring a 5k or half marathon. Do these sound familiar? Maybe you’ve done one or all of these? Did you ever try to figure out what the R.O.I. on any of these activities was? Have you ever tried to tie any of these to new patient referral? Hit ‘em where they ain’t. We researched how patients get information on the PCP or healthcare network they eventually choose. Here’s what we found out. Almost 2 out of 3 patients got their information from friends, family and coworkers. In other words, other community members. Your employees! Meaning you need to educate your employees to tell your network’s story to the community. The differentiating factor is authenticity. No ad will compete with actual healthcare network employees talking about they serve their patients. No billboard will outsell real patient success stories a trusted community member has witnessed. Whether it’s at the grocery store, a parent-teacher conference, a network sponsored 5k, or at a recently-acquired facility, your employees are in the community every day. They are talking with their friends and family. It’s up to you to give them the information they need to become your network’s best advocates. So how do you equip your employees with that information? 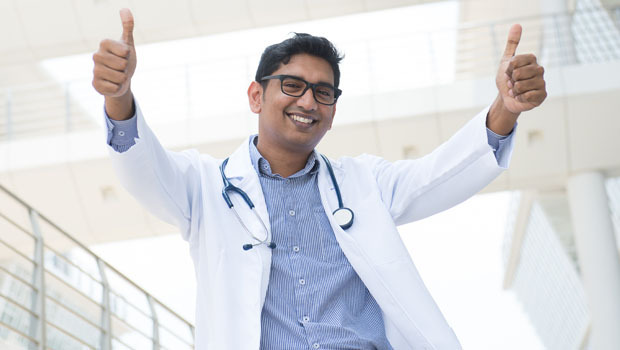 One way to do that is to build a healthcare-specific employee advocacy program that rewards your doctors, nurses, and allied health professionals for referring new patients to your network. But how do you start building an employee advocacy program that can outperform any advertising you’ve done in the past? You start with engagement. Which takes us to strategy number 2. Before your employees can become advocates, they have to be engaged and excited about working for your network. They have to believe your health network is the best. Employee engagement is important for all businesses. But in healthcare, employee engagement is critical. Disengaged medical professionals are more likely to leave their networks. Higher healthcare disengagement rates have been linked with poorer patient outcomes. And a pattern of poor patient outcomes can offset any kind of healthcare marketing. So to avoid HR, patient care, and marketing problems, healthcare networks need to keep their employees engaged. A healthcare network that has worked with Viddler for almost a year is seeing sustained voluntary employee engagement rates over 60%. That’s right, 60% voluntary engagement after almost a year! The typical employee engagement rate is far below 30%. The secret to that incredible engagement rate? A video employee engagement system. Meaningful video content that celebrates your network’s employees and patient success stories. Keep these videos short, fun, and to the point, and your employees will actually want to watch them. With every video, they’ll be reminded of the impact and meaning of their work, and the reasons they chose their professions. An added bonus is that it’s very simple to turn a video employee engagement system into an employee advocacy program. Just add a tracking system, and a rewards program. This is how it works: say you produce a video about any of the awards your health network has received in the last year. The employees who watch this video would receive points- and the employees who share it on social media would receive even more points. Your employees can cash those points in for prizes and perks. It seems simple right? But here’s the brilliant part: it’s organic. No pestering your employees, no cheese. Your employees will naturally be reminded of the things your network does best. One of your orthopedic surgeons receives a best-in-state award? Your network employees will hear about it as it happens. And if someone in one of your employees’ personal networks needs a back surgery, your employee is equipped to refer their friend, family, or community member to your network’s crackerjack surgeon. Your community wins because they are more aware of their options. Your employees win because they are now more engaged than ever. And your healthcare network wins because you retain your top talent and will get referrals from a source your competition can’t match- your employees! Posted in Employee Engagement, Healthcare, Interactive Video, Marketing and tagged best.